As part of the Los Angeles Waterfront redevelopment project, internationally-recognized artist Mark Dion created "Ship in a Bottle," the first of several planned public art installations underway. The sculpture, an 8-foot scale model of a container ship inside a 12-foot clear glass bottle, puts a modern twist on an age-old craft. 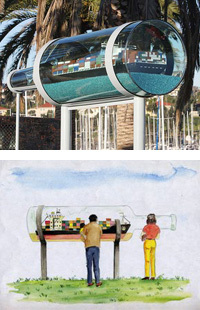 "Ship in a Bottle" is installed at the south end of the new marina development in San Pedro, Cabrillo Way Marina Phase II, near 22nd Street Landing. "The art of crafting miniature ships in bottles was a favorite pastime of sailors, who have been important participants in the Port's long history and culture," said Mark Dion, "My 'Ship in a Bottle' is a contemporary concept to unify the aesthetic of contemporary public art with that of vernacular, nautical craft-work and to respectfully acknowledge the central role played by the Port of L.A. and the city of San Pedro as the gateway of international commerce in the United States." From Mark Dion's biography: Mark Dion is known for making art out of fieldwork, incorporating elements of biology, archaeology, ethnography, and the history of science, and applying to his artwork methodologies generally used for pure science.